This is a delicious tart, and a grand way of using the January supply of marmalade oranges. The juice is used to make a delicious orange curd that is baked in a pastry case. The recipe is from the Moro cookbook. Add the egg yolk and mix until the mixture comes together – it will be quite stiff and dry. You may need to add a teaspoon or two of milk or water. Shape the pastry into a ball, wrap and chill in the fridge for at least one hour. When you are ready, grate the pastry on a coarse grater, and press it evenly around the edges and base of a tart tin, to a thickness of around 3mm. Prick the base and rest the pastry case in the fridge for 30 minutes. Put the oven to 220C. Next, make the curd. Put all the curd ingredients into the top pan of a double boiler, and cook slowly, stirring until thick. The mixture will thicken quite suddenly, after about 15 minutes or more. Spread the curd into the tart shell, and bake at 240C for 10 minutes until the surface starts to brown. As soon as the tart is baked, remove from the oven and leave to cool before serving. This is delicious served slightly warm, with something cool and creamy. Try beating 50/50 creme fraiche and mascarpone together. I have several recipe books devoted to preserving, jams and other such domestic creativity. This particular recipe for marmalade works well for me and for Mr B, who has very particular standards. The marmalade should set well, be a pleasing colour, with good distribution of peel. The shreds of peel should be fine and short, about the thickness of a penny and maximum one centimetre long. Wash the oranges, and put them in a large covered pan and simmer for around an hour and a half. Remove the oranges from the liquid, and allow to cool. 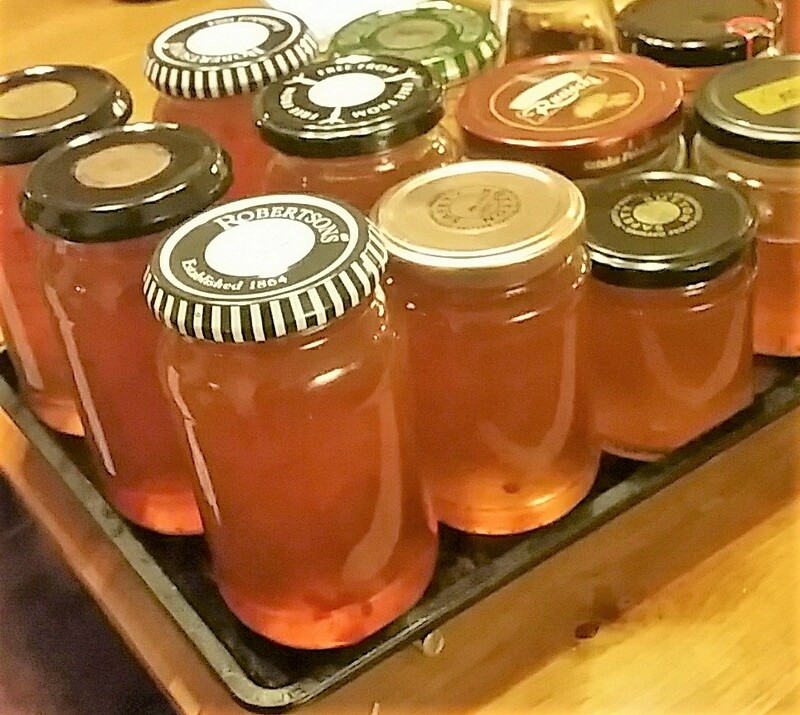 Put around 8 clean jam-jars on a sheet in the oven at around 90C to warm and sterilise. The messy bit; cut the oranges in half, and remove the pips. Scoop out the pulp and add to the pan. To get a good set, put the pips in a small pan with some of the liquor and bring to the boil, and then strain this back into the big pan. Next, cut the rind of three or four of the oranges into fine shreds. I do this by cutting the rind into 1cm wide strips, and then running a table knife along the inside of the peel to remove as much of the pith as possible. Then I chop into fine shreds, only adding the best ones to the pan. How much you add is a personal choice. Start to bring the mixture to the boil, and add the sugar, stirring all the while. Keep boiling until setting point is reached – around 222 (jam) on the thermometer. Use the wrinkle test and the flake test as well. Pour the marmalade into the warm jars, and leave to set. A word about the flake test – this is my favourite method of checking that the jam or marmalade will set. I dip a spoon into the boiling jam and hold it horizontally. As the jam drips off the edge of the spoon, it will start to set, and the drips will start to join together, to form gelatinous webs.